In the upcoming weeks here on Needle ‘n Thread, I’ll be sharing some simple, effective, and fun ways to embroider monograms. 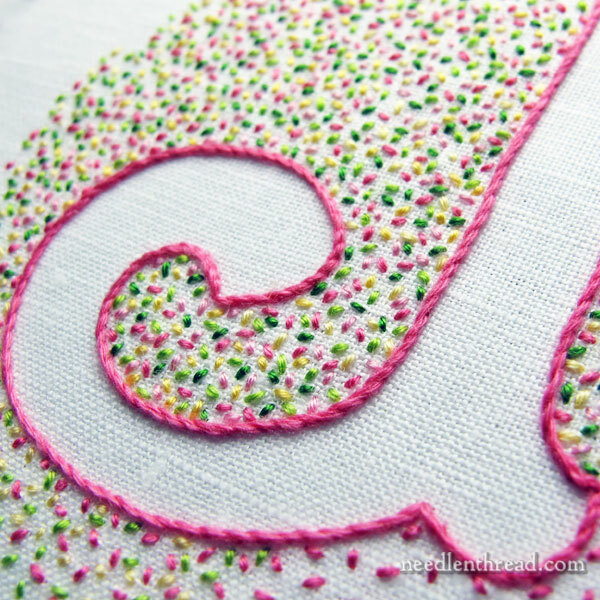 Today, we’ll look at a very basic “voided” monogram and chat about how to stitch it up. If you love monograms and you’re looking for something very easy and relaxing to stitch, this will fit the bill! When we talk about “voided” embroidery, generally we mean embroidery that covers the ground fabric everywhere except where the actual design is. The design really stands out because it’s left blank amidst a busy ground fabric more or less covered with stitching. Voided embroidery isn’t limited only to monograms. So if you’re not a huge fan of monograms, you can take any bold shape with good clean lines and turn it into a voided embroidery project. Clear silhouettes of pretty much anything recognizable would work well for voided embroidery. 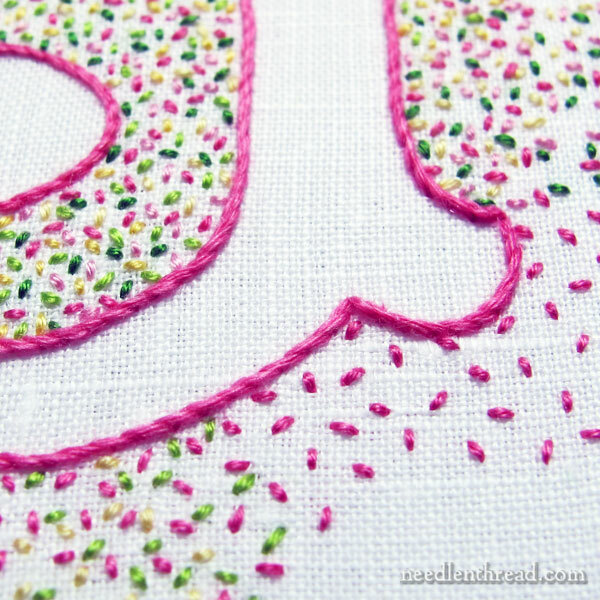 There are different ways to go about a voided embroidery project – today’s example is one of the easiest ways to do it, using a stem stitch outline for the letter and then covering the ground fabric with random, multi-colored seed stitching. Start with a lettering style that has bold, clean lines and some some space between most of the lines in the letter. With this particular Confetti monogram, I chose one of the letters from the Plain, Bold Letters in Favorite Monograms. In Favorite Monograms, there are several alphabets that would work well for voided embroidery: the plain, bold letters (like the J I’m using), the shadow work alphabet, the open script alphabet, and the modern Roman alphabet. Transfer your letter to your ground fabric. For the Confetti J, I’m using a handkerchief weight white linen, backed with white muslin. Backing or lining the lightweight linen with the white cotton is really essential, because I don’t want the threads on the back of the fabric to show through to the front and detract from the seed stitching. I traced the 2.5″ letter directly onto the front of my ground fabric, using a light pencil. Since the line will be completely covered with stitching, I didn’t worry too much about whether my transfer medium will wash away. However, it just so happens that I starched this particular piece of linen before I ironed it, so there should be no problem with a light pencil line washing away easily. I wrote about using spray starch when transferring designs here, if you want to read more about it. Once your design is traced, hoop up both pieces of fabric in a 4″ embroidery hoop (or whatever size you want or need for your particular design). The fun part – picking out colors! Floche is a lovely embroidery cotton. (You can read all about it here.) It’s a single strand embroidery thread, with a soft twist and a very soft, beautiful sheen. If you don’t have floche, just substitute two strands of regular floss (from the six). The color numbering for DMC floche and DMC stranded cotton is the same. If you want your stitching to be a little heavier, you can even use three strands of floss. Up to you! I used a #7 crewel needle for all the embroidery in this project. Outline the letter using stem stitch. If you haven’t mastered the stem stitch yet, you can read all about it here. The tutorials that will help you the most with this particular letter style are the stem stitch video and perfect corners with stem stitch. Now it’s just a matter of seed stitching the background all around the letter! For my project, I used all six colors of floche for the seed stitch, and I worked my seed stitch rather small, slightly longer than 1/16″, but not as long as 1/8″. You can definitely speed up the process of seed stitching the background by working slightly larger stitches (1/8″, for example). The longer the stitch, the less “seedy” the whole thing will look, so I wouldn’t personally go much longer than 1/8″. I started with one color of thread and seed stitched an area. The stitches point in random directions, and are spaced out, so that I can work the other colors in between. On the lower right corner of the J, you can see where I seed stitched in dark pink only. I’ll fill in between those dark pink stitches with the other colors. The key to good coverage to achieve the same type of look is making sure that your tiny stitches are more or less evenly spaced apart (you don’t want stitches butting right up to each other) and that the color distribution is consistent (as much as possible). In the scheme of the whole finished piece, any inconsistencies in color distribution will more or less blend in, so you don’t have to really stress out about that. Just make sure that, as you work along, you work all your colors into a given area where you’re stitching. Don’t try to have all your threads going at one time, switching threads with each seed stitch! This would be an inefficient way to stitch, and you could end up with knotted and tangled threads all over the back. If you do have one or two threads you aren’t finished with (you can see that I’ve parked two threads, one on each side, in the photo above), you can “park” them off to the side by bringing them up from the back to the front of the fabric, out of your stitching path, and leaving them until you need them again. You can read all about parking embroidery threads in this article, if you’re unfamiliar with parking your threads. The more threads you park, though, the more complicated things can get on the backside of the hoop, so I’d recommend parking no more than one or two threads at a time. So, basically, I just seed stitch an area with one color, until I run out of that color. Then I grab another color and add some seed stitching to the same area in the new color, until I run out of the new color. I continue doing this until I’ve added all six colors to the area and started a new adjacent area. Occasionally, I hold the piece out away from me and look for holes in the seed stitched areas. If I find any, I just fill them in with whatever color happens to be in the needle at the time. In a nutshell – trace the design, stick the fabric in a hoop, outline the letter with stem stitch, and seed stitch your heart out all around the letter! 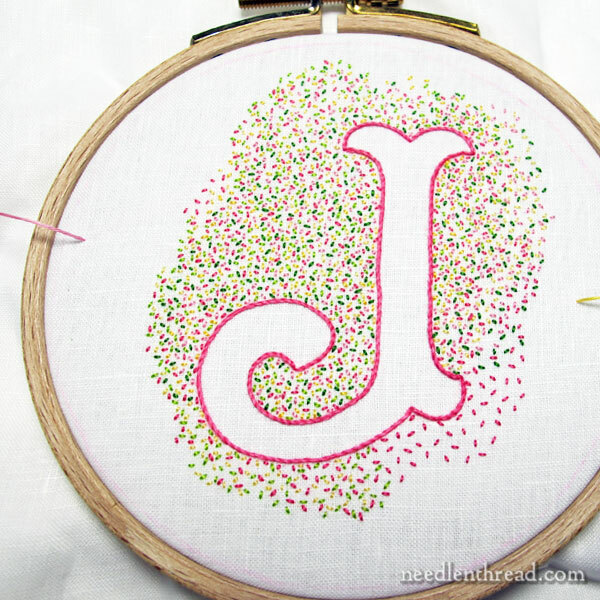 You can find the alphabet I’m using for the Confetti J available in Favorite Monograms, if you’d like to give this simple, effective approach to voided embroidery a try. I hope you do! It’s loads of fun! February 13, 2017 Would You Bee Mine? Playing with Monograms! So cute!! I’d love to try this. Now I’m just wondering what you will do with this piece? Finishing is always the hardest part for me. Have you made a voided embroidery with french knots instead of seed stitches? I love this technique — thanks for sharing that Mary. I’m going to have to incorporate this soon, I think. This is truly beautiful. How would you compare this to a monogram done in an Assisi Stitch? Hi, Nick – sort of, but Assisi work is counted and the resulting background is solid. But as far as its being voided, yes, same idea! I love the idea of voided embroidery, but I don’t find the seed stitching mindless at all. I would be too concerned about getting the density of each color just right. I always enjoy learning so much from you. Your referral links to previous instructions are so helpful. I am enjoying your new Monogram ebooks! instead of using a lot of different threads, using a multi-coloured variegated thread could be another alternative. Dear Mary, What a wonderfully young monogram you’ve designed!! The first thing I thought when I saw it was ‘100s and 1000s’ (very tiny coloured sugar balls). I don’t know if you have them in America but most Australian children’s parties have at least one plate of buttered white bread cut into triangles with 100s and 1000s on them. This would be an excellent monogram for a grandchild. I am new to embroidery so this project is perfect, and your instructions are excellent. I love the colors but since I am a newbie, I might use a single color. If this technique is used in a napkin, the stitches on the back will be at the open. What is recommended for a cleaner look. Also, it would be a good reference to see the back of the project for modeling good techniques. I’m very late with this post but I absolutely love this idea of voided embroidery what a great way to embroider monograms I never thought to stitch outside the monogram and what a great gift idea. I’m starting a new monogram for my Niece who is getting married in February 2017 and this would be a great idea gift for her and her new hubby. Thanks for sharing this new way of embroidering monograms really brilliant idea and wonderful gift. I just found your website through Pinterest and I feel we have much in common. I love embroidery, anything with a needle and thread connected to it. My mother taught my sister and me to embroider when we were very young. She loved to embroider and decorated everything with flowers. My paternal grandmother embroidered quilts squares for us in 1932, we have matching quilts; mine is made with Depression Green and my sister’s in blue. Hardanger is my favorite handwork. I was fortunate to be able to copy antique hardanger from pieces done by a friend’s mother and grandmother who migrated to America, it is a bit different. Their kloster blocks had 7 satin stitches where today we use 5. I will explore your website more thoroughly as time allows. I am travelling around the world without leaving home by visiting foreign countries and teaching myself their native stitching projects. So far I have visited 17 countries. We are truly sisters tied together by threads. Hi, Carol – that sounds like an amazing learning project, learning native stitches from all over the world! And 17 countries is pretty amazing! Are you working them in a sampler? I think it would be great fun to do a “world sampler” and to learn a little bit about each country and their arts while doing it… Something to add to my perpetually growing to-do list. 🙂 Thanks for your note! Since each stitchery requires different sized linens, it might be difficult to get them all on one sampler. But it is something to think about. A year ago our guild had a display of our needlework at the Quilt Museum in Cedarburg WI. Because my work was from many nations, I had my own display featured separately. I went to the museum once a week to explain the different types of needlework to the visitors. I love learning new techniques. I recently downloaded your Stitch Sampler Alphabet project. I’m working on one of the monograms for a wedding present. The directions are so clear and easy to follow. I love, love, love your website and have been a fan for several years. I just love this. I haven’t been able to do detailed projects with my hands due to health issues — but this is one that does not require perfection!!! I can’t even begin to tell you how many hours in the car that I have spent on this. I decided on a heart. My stem stitch isn’t so great, but the seed stitches are getting better and better as I do them. Thank you so much for this idea!!!!! It has helped me to hold the needle better and put in stitches better. I can tell where I started and it really looks cool. I noticed that I did super small stitches to start with and they have now evened out and are more consistent — I have more control over the size now. I really can’t thank you enough. Great beginner/starter project! I love this site. Thanks for sharing your knowledge. That’s correct, Mary, which is why it’s important to back the ground fabric with another layer of fabric, if you’re using a ground fabric that’s medium weight or lighter.